What is the difference between CIE LAB, CIE RGB, CIE xyY and CIE XYZ? CIE is the International Commission on Illumination (Commission internationale de l’éclairage). If SMPTE is the authority on all standards pertaining to video, then CIE is the authority on light. They formed in 1913. They should make a movie on that. In the 1920s, W. David Wright and John Guild independently conducted a series of experiments on human sight, from which they tried to determine the colors in human vision, and give it a mathematical basis. From Driving Miss Digital we know that the eye reacts to the three primaries RGB separately, and the colors we see are just sensations these wavelengths cause in us. Think about R, G, B as Rabbit, Giraffe and Bull. These three animals are three different physical objects. On a graph (or even in real life), they can’t occupy the same space. In order to study these animals as one group, they must be in the same cage, if you will. And scientists are only interested in these things if it can also be justified mathematically. So what does three primaries R, G and B mashed up look like? If you look at the above diagram (called a Chromacity diagram), you’ll notice that white is at the ‘center’. The edges are each color at the maximum saturation, whatever it might be. The triangle is CIE RGB. They tied the Rabbit, Giraffe and Bull with a mathematical rope to a common ‘white post’. Depending on the system, this white post can also shift – like if you have Rats, Grasshopers and Bears. The scientists soon realized that this ‘color mash’, called a gamut, can change in space if they made each measurement independently. Just like they faced a problem putting R, G and B together, they have to find a way to correlate two different gamuts. They had to create a bull pen and ensure most useful color spaces stayed within a standard boundary. What would one base this boundary on? Like every group with vision, they based it on the human eye. In 1931, based on the results of the CIE RGB version of the human eye, CIE mathematically determined a color space (the bull pen, a theoretical area) called the CIE XYZ 1931 color space. In the above diagram, the colored area is the CIE XYZ 1931 color space. This area is the mathematical limit of human vision as far as color is concerned. As you can see, the total color space of the human eye is greater than the experimental results of CIE RGB. CIE RGB was not perfect, but considering the technology available at the time you could say it was a phenomenal effort. Important: The chromacity diagram might look two-dimensional but it is really three dimensional, like our jujube bag. The diagram is only the most ‘widely used’ cross section of it – the Mona Lisa of color spaces. XYZ is not RGB. X, Y and Z are extrapolations of RGB created mathematically to avoid negative numbers (In 1931 there weren’t any computers) and are called Tristimulus values. Y means luminance, Z is somewhat equal to blue, and X is a mix of cone response curves chosen to be orthogonal to luminance and non-negative. Say goodbye to any notion that XYZ means RGB. In CIE xyY, Y is the luminance and x and y represents the chrominance values derived from the tristimulus values X, Y and Z in the CIE XYZ color space. The small x and y values are used to draw the chromacity diagram of the CIE XYZ color space. It is just another way to represent CIE XYZ. If Y represents luminosity, then Cb and Cr shoulders the burden of representing all colors. You are witnessing the birth of Y’CbCr, incorrectly known by the masses as YUV. CIELAB, actually CIE L*a*b* is a color model+space combo in which L is brightness and a and b are chrominance components, with the difference that the color values are far more than the human gamut. This color space, also called Lab color space, also has imaginary colors that cannot be reproduced in the physical world. 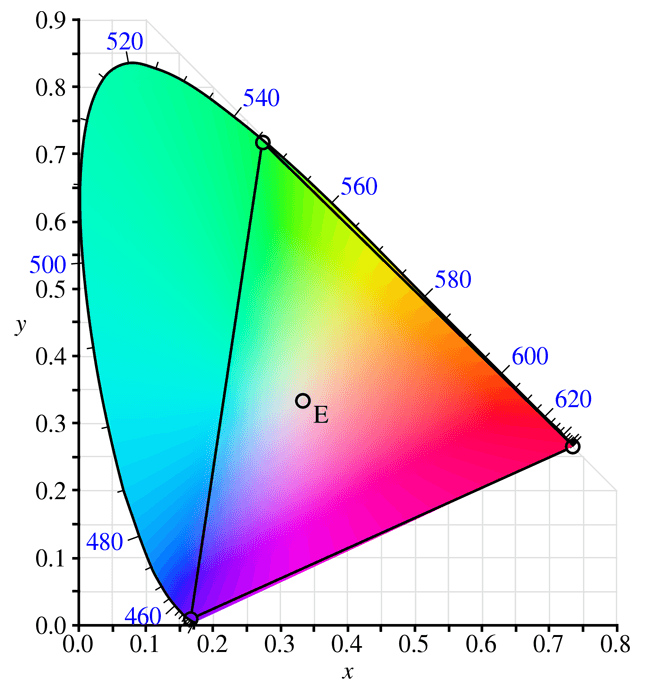 Since L*a*b* color space includes all perceivable colors its gamut exceeds those of the RGB and CMYK color models. Lab is neither RGB or CMYK, but a totally different color model. It is has a gamut that is greater than human vision. The unique goal of the L*a*b* model is to be ‘device-independent’. The colors should not be dependent on the device they are displayed on. It is a purely theoretical color space that is used sometimes as an absolute standard to compare all other color spaces. The L component closely matches human perception of lightness, and by having it as an independent quantity to control, it can be used to make accurate color corrections without affecting the a and b color twins (dissimilar twins, of course). RGB or CMYK color spaces are designed to model the output of physical devices rather than human visual perception. To change the Luminance one will have to resort to math vodoo, instead of having direct and accurate control of it. The controversy (I wouldn’t call it a problem because the poor bugger is only theoretical) is that, since Lab colors fall beyond the range of human vision, many of its colors are imaginary! There is a certain school of thought, which is quite popular today, that having this extra gamut is helpful to computer algorithms in photo and video editing applications to make more precise calculations. It is impossible to make a general statement that covers every secret algorithm, so this ‘advantage’ still remains controversial. I urge everyone to make their own tests, within the specific conditions of their workflow, to determine whether working in Lab or wide-gamut spaces is actually beneficial in any way.